Are there Shar’iyah principles in respect to dealing with rivers, whether their origin to their mouth (end-point) are within the Khilafah state, or they pass through the state and into another? Jazaakum Allah Khairan. “And beware of them, lest they tempt you away from some of what Allah has revealed to you”. The major rivers are public property (Mulkiyah ‘Aammah) and they fall under two types of the public property. From one angle, they fall under the collective amenities which are indicated to within his speech ﷺ: «الْمُسْلِمُونَ شُرَكَاءُ فِي ثَلَاثٍ: فِي الْكَلَإِ، وَالْمَاءِ، وَالنَّارِ» “The Muslims are partners in respect to three (matters): The pasture lands, water and fire” (Narrated by Abu Dawud). They are also from the types, which by the nature of their formation, prevent individuals from exclusively taking them into their possession. That is based on the Hadeeth of Prophet ﷺ: «مِنًى مُنَاخُ مَنْ سَبَقَ» “Mina is the resting place of the one who reaches it first” (Narrated by At-Tirmidhi). Further details can be found in the book, Funds in the Khilafah State and in the book, The Economic System in Islam to be referred to. “… (In regards to) the major rivers like the Euphrates, the Tigris and Gihon amongst others, then no one has a right over exclusivity. Rather, they are the right of the masses. So, everyone who is able to water his lands from them, then he has the right to do that, just as he has the right to set up mills, waterwheels and what is similar to that. That is as long as it does not negatively impact the major river. If it (i.e. the usage or activity) does have a negative impact upon the river, then the person is prevented from that. In addition, the digging i.e. maintenance of the great rivers is a duty upon the authority (ruler) to undertake from the wealth of the Bait ul-Maal. That is because their benefit returns to the general public and consequently the funding of that is found within the public funds and that is the funds of the Bait ul-Maal…) End. “The Kharaaj is by guarantee … and if submerging is feared from these rivers then it is the duty of the Sultaan (ruler) to fix or rectify its dams from the Bait ul-Maal”. Article (1238) – (The public non-owned rivers, and these are the rivers that have not been included in Muqaasim i.e. in the runnings of the collective ownership, are also Mubaahah (permissible) like the Nile, the Tigris, Danube and Tonga Rivers). The public unownable rivers, and these are the rivers that have not been included in Muqaasim i.e. in the runnings of the collective ownership, do not fall under the ownership of anyone. That is like the seas and lakes. Rather they are Mubaahah (permissible). For that reason, everyone can seek benefit through them upon the condition that it is not harmful (or detrimental) to the general public as has been explained in Article (1254). The person can open up a stream or conduit and run water from it to his land and irrigate his land, set up a mill, water scoop and water hole. If, however, that was harmful (or detrimental) to the ‘Aammah (public), where the water overflows and ruins the rights of the people or prevents the movement of boats, then all of the people have the right to prevent it. This is relation to the rivers. As for the sea, then benefit is sought from it even if it harms. This is what Al-Quhustaani stated (clearly) and this issue will be examined in the explanation of the Articles (1263 and 1264). In respect to these rivers, all of the people have the right to Ash-Shaffah (feeding livestock, domestic utility and drinking), whether that is harmful to the public or unharmful. 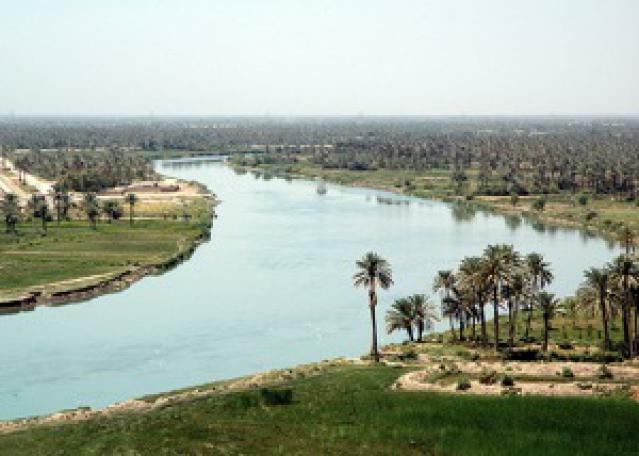 In regards to the unownable public rivers like the river Nile that flows in the Egyptian region, the river Euphrates which flows in Iraq, the Tigris (Dijla) (which is read with a Kasrah on the Daal and a Fat’hah), the Shatt-ul-Arab (which is the result of the convergence of the Tigris and Euphrates), the Danube, a part of which lies in the lands of Romania, the Tunca River which is also called the Maritsa River which runs through the town of Edirne, all of these major rivers are not anyone’s property because the ownership according to Article 1249 occurs through acquirement and placing the hand over it. This acquirement and placing one’s hand over it is not possible in respect to these rivers. As long as these rivers cannot be taken possession of and acquired then they remain shared amongst the people according to Article 1234 and the right for all the people to attain benefit from it is affirmed in accordance to Article 1265 (The enlightenment and refuting the bewilderment in respect to the beginnings of Ash-Shurb and Az-Zayla’iy in respect to Ash-Shirb). ((Article 1265) Everyone has the right to irrigate his lands from non-ownable rivers). Article (1265) – Everyone has the right to irrigate his lands from the unownable rivers and he has the right to open up a stream or conduit to irrigate his lands and to set up a mill. However, it is stipulated that others are not harmed. For that reason, if the water overflows and is harmful to the creation or it interrupts the rivers water completely or blocks the passage of boast then that is prevented (or forbidden)). Everyone has the right to Ash-Shirb and the right of Ash-Shaffah in respect to the unownable rivers which means that he can irrigate his lands. That is if someone has revived barren land close to the designated river. He can open up a stream or conduit and let the water run from the designated river to his land that he has revived. (The explanation of Al-Majma’ in respect to the Shirb). That is if the place that the spring has been opened up from is a property of his. It is also the right of anyone to drink the water from the designated river, to perform Wudoo’ from it, wash clothes and to open up a stream or conduit within his owned property or the barren lands from anew or in increase, to irrigate his lands and he has the right to set up a mill. This would be like when the spring has three conduits; he protects it and makes four or five conduits for it (Al-Hindiyah in the second chapter from the Shirb). Similarly, if it was a large unownable river close to the vineyards of someone and the owner of the vineyard wanted to set up irrigation equipment upon the river to irrigate his vineyards and there was no harm to others in doing that, then the owners of the vineyards and irrigation equipment located under his vineyard have no right to prevent him from doing that through claims of it being against their consent. If the regulation of the usage of the major river and benefiting from its waters requires the state to intervene by putting down detailed regulation for that, then the state will put in place administrative systems that will organize the matters related to irrigation, movement, transport and other than that… In light of the current material technological advancements, then it is most probable that it will be the state that undertakes the organization of the irrigation, delivery of water to the houses and farms, the travel movement and transportation within the rivers… The state can place fees for the usages and benefits acquired from them upon the condition that the profits resulting from that return to the Bait ul-Maal of the Muslims within the public property revenues section. If parts of the major river flow outside of the authority of the Islamic state, then the state will convene, if necessary, bilateral agreements or treaties with the state that it is related to, in accordance to the (dictates of the) Ahkam Ash-Shar’iyah. That is in order to organize the utilization of the river without affecting the interests of the Islamic state detrimentally and it is done in accordance to the Ahkam Ash-Shar’iyah related to the public properties… If an act of aggression or hostility occurs from another state by preventing the flow of water of the major river from reaching the Islamic state or by its exploitation in a manner that harms the interests of the Muslims, then the state will take the political, economic and military measures that enable it to remove the harm brought about by the other state, even if the matter reaches the point of war against the aggressing state to take back the Haqq (right). I will draw attention to the point that throughout history, the states that are upon the shores of the major rivers did not used to prevent each other from benefiting from the waters of the major river (the international river). Indeed, all of the states located upon the rivers benefited from the rivers without that being problematic… Problems related to the international rivers did not arise until the age of western colonialism which took them as a means for colonialism and exerting political and economic pressures upon other states. The right in respect to the public property belongs to the subjects of the Islamic state and not to other states. As such, the state imposes fees upon other states’ usage of the rivers located under the authority of the Islamic state. It can also sell them its water, electricity that results from the water and what is similar to that … It will then place the profits realized from that within the Bait ul-Maal to spend upon that which the Ahkam Ash-Shar’iyah has permitted. In respect to the organizational procedures that the state puts into place for the beneficial utilization of the major rivers; dividing its waters and organizing movement or transportation within them, it pays attention and consideration to the rivers not drying up, the flow being interrupted or impeded, the pollution of its waters or to any other harm that can befall them. Just as it makes effort directly to remove any harm that happens unintentionally… It adopts water policies characterized by justice in respect to the division of water shares (or quotas) and at the same time it is characterized in respect to preserving these water sources in the best manner possible … All of this is not detached from the economic policies and the general environment that the state sets. I hope that this summarized answer is sufficient… and its completed explanation will happen at its time Inshaa Allah. Previous PostReal Americans do not care who won the US election! Next PostRahmon’s Regime cannot break the will of Muslim women in Tajikistan!